Length of 8", Diameter of 3.5"
Protect your stored gear with this medium LensPouch from LensCoat. This lens pouch is 8" in length and 3.5" in diameter, comfortably fitting lenses one inch smaller in measurements for safe storage and transport. 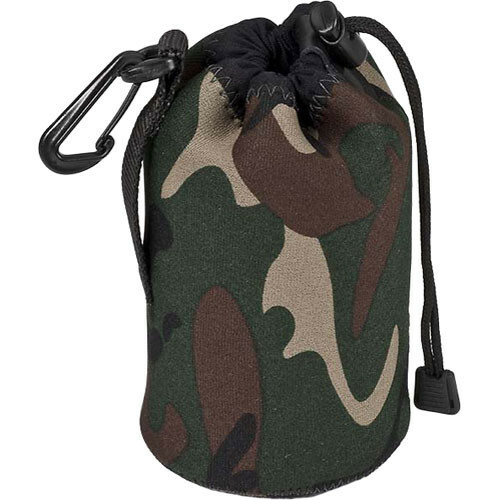 It is made of a soft neoprene material and comes in a forest green camouflage pattern. Box Dimensions (LxWxH) 8.7 x 8.4 x 3.25"
LensPouch (Medium, Forest Green Camo) is rated 4.7 out of 5 by 20. Rated 5 out of 5 by Anonymous from Why pay more?! I'm a loyal Canon fan, but I prefer to buy some accessories from 3rd-party manufacturers. This pouch is a great example...it's $20 cheaper than the Canon-brand pouch, but serves the purpose perfectly. This is good quality, and is large enough to hold both the lens and the optional hood, provided the hood is reverse-mounted, as is common, for storage. Rated 5 out of 5 by Brev00 from Excellent item! Exactly what I wanted. I bought this lens pouch for my Tamron 70-300 vc. This one fits it like a glove. It is a lightweight cover that might not provide protection from a fall onto concrete. But, I got it to protect it inside backpacks and camera bags or, perhaps, to hang from a belt. It seems perfect for this and it does have a nice padding for the front of the lens. Rated 4 out of 5 by mamba mama from Compact and convenient I purchased the lens pouch to protect my zoom lens for my cannon camera. We are going on vacation out to western US. and I wanted to get a zoom lens to take great pictures of wildlife. This pouch will conveniently fit where I want to carry it along and protect it from getting banged up. Rated 5 out of 5 by AK Photog from Great Product! This is perfect for storing my longer zoom lens while its not on the camera. I can just throw it in a backpack while traveling or hiking and never have to worry about my lens getting banged up. It also has a convenient hook so I can clip it to my belt or side of my backpack for easy use. Rated 4 out of 5 by Zootastic in MD from decent Pouch for our 300 zoom. Holds both the lens and lens hood. A little bulky but we know it's going to protect the lens while traveling or not in use. Rated 4 out of 5 by Anonymous from Pouch Nothing special - it holds the lens and protects it from dust...Does what it is suppose to...I have it for my 70-300 lens and it fits well. Rated 4 out of 5 by Anonymous from Great lens Pouch Works great for hiking, biking, and carrying an extra lens around. Mounts easily on your belt. Would this be deep enough for a DFA 100mm 2.8 WR Pentax Lens? Yes this bag will fit the 100mm. Will this hold a Nikon 24-70 to Nikon 85mm?